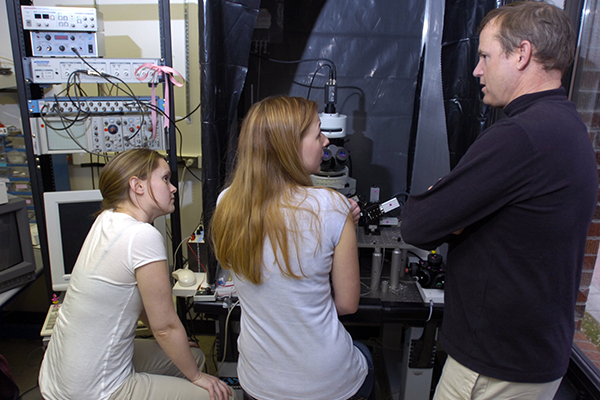 UM’s Neuroscience Program is very excited to announce the recent approval of an accelerated degree track in Cellular & Molecular Neuroscience that allows students to earn a dual B.S./M.S degree in five years. This is an exceptional opportunity for motivated students who wish to receive advanced research training in Neuroscience to more competitively position themselves to enter either graduate/professional schools or the biomedical/biotech sector. There are only a handful of such programs in the country. The University of Montana Neuroscience Program now offers a combined Bachelor of Science and Master of Science degree in Neuroscience with an emphasis on Cellular & Molecular Neuroscience. This five-year (“4 + 1”) accelerated program is designed for students who have demonstrated academic excellence and are deeply interested in pursuing intensive research training in preparation for graduate/professional schools, or who wish to enter the biomedical/biotech sector with advanced standing. The first 3 years of study are aligned with the existing Cellular & Molecular track of the B.S. in Neuroscience. Some students in the Cognitive & Behavioral track may also be eligible, depending upon their course selections. In the 4th year, students will take graduate neuroscience courses and complete their B.S. degree. This will allow students to enter the Neuroscience Graduate Program with advanced standing and, pending completion and defense of an M.S. thesis project, earn an M.S. in 5 years. To enter to the Dual 5-years B.S./M.S. program students must be pursuing a B.S. in the Cellular & Molecular track (or the Cognitive & Behavioral track with appropriate course options) of the undergraduate Neuroscience major and apply before the end of the Autumn semester of their Junior year. Owing to the late start of the first year of the program, applications will be accepted until March 1, 2019. Most importantly, students must identify a research mentor, project and plan of study as part of the application process. This may necessitate a student working in the laboratory of their prospective mentor during their Sophomore year. We also recognize that there will be Neuroscience majors in their junior and senior years who will be unable to apply to this program because they are too far along in their study plans to meet the required time frame. This is an unfortunate consequence of starting any accelerated program and we regret any frustrations this may cause. We also hope a similar dual degree can be established in the near future that aligns with the Cognitive & Behavioral Neuroscience track. Neuroscience majors, especially those in their junior or sophomore years, who are interested in the BS/MS dual degree program should contact Professor Richard Bridges as soon as possible. Application materials and a program handbook will soon be available online.